Its scientific name is Synanceia Horrida and it lives in tropical waters of the Indian and Pacific oceans. In the underwater world, you do not have to be the biggest creature to be the biggest threat. The stonefish or rockfish, which reaches an average length of 30 to 40 centimetres and up to 2 kg in weight, is the most poisonous fish in the world, carrying poisonous sacs in each of its 13 spines. Although the threat to responsible divers is minuscule, we tell you 5 facts that you will want to know about these interesting and toxic underwater creatures (if you find them). 1. There are five species of stonefish that can be found in the coastal regions of the Indo-Pacific oceans. 2. As the most poisonous fish in the sea, most would assume that the stonefish kills its prey using poison in its spines, but this is not the case. Instead, the stonefish captures its prey with great speed. To hunt what is going to be their food, the stone fish wait for the prey to appear and then they swim fast and attack it quickly. The attack can only last 0.015 seconds! When it does not chase its prey, the stonefish usually swim very very slowly. 3. 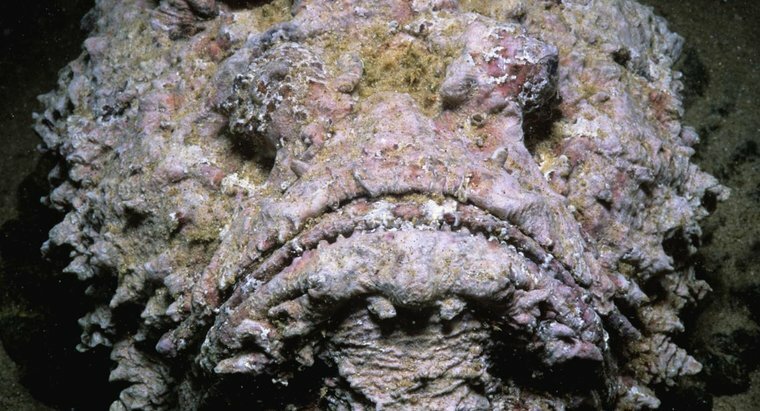 It has excellent camouflage capabilities, so the stonefish can be difficult to distinguish. If you like to dive, of course, it is exciting to detect the creatures that are better camouflaged but remember to pay attention to what is hidden in the rocky bottom or coral. 4. Do not panic if you see it, the stone fish will not deviate from its path to attack you, but will use its venom as a defence mechanism against predators. The venom is usually released when pressure is applied to the stone fish’s spine, which means that the poison is more often emitted when the stonefish is attacked by a predator or stepped on by a human. It will never go directly to attack a human. If for some reason you accidentally step on a stonefish, seek immediate treatment, since the poison can cause severe pain, heart failure and even death if left untreated. Hot water can be used as a temporary relief; however, it is essential to seek medical attention and have an antidote. 5. The stonefish can survive up to 24 hours out of the water, which is a rare feature among fish.